"Mama Mia, pizza pie, I a stepped in it now. Just a what was I a thinking? The Poor People's Pope! Jesus walking sideways, Moses on the Half-Shell, Lord have mercy." VATICAN CITY -- The poor are descending upon the Vatican like fervent locusts looking for corn and cheese handouts. The hoards of hobos, beggars, street drummers, and homeless poets are miraculously getting themselves off the heating grates and over to St. Peter's Square. Some arrive on aching feet after hitching a ride to a place where they could jump a freight. Others hid on a boat, and then walked a few miles a day until they reached Roma. Bumming cigarettes from all who cross their path, chasing soda cans for street value, and hiding the bottle where the missus never goes, the poor roar out obscenities just because they've earned the right. The destitute of the world seem to have taken Pope Francis' at his word when he literally said that his papacy is for them, the poor. They have now Occupied St. Peter's Square. "I hope you can hear me over the din," yelled CNN's Anderson Cooper. "The poor stretch as far as the eye can see and the nose can smell, living simply in cardboard boxes lined with garbage bags and sleeping in things they call 'tents' made of cellophane, rubber bands, and aluminum foil. 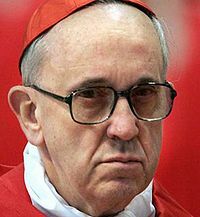 The racket of the impoverished asking each other for a dollar or a euro to take the bus actually drowns out the singing of the Vatican choir which is forever rehearsing for the next papal funeral." "Here now, in a CNN exclusive, is the poor people's spokesperson, Tugboat Mary. Mary, will you tell us the Movement's demands," said Cooper, gesturing towards a pile of rags which suddenly start to talk. "We demand cable television," Mary screeched while scratching mites, "and we demand hot dogs on a stick." "But no, I mean, don't you want to ask governments and humanity as a whole to finally get around to ending poverty, housing the homeless, and feeding the world's hungry?" Cooper asked. "Which, surprisingly, doesn't cost that much when you compare it to the military and other overextended areas of each nation's budget," Cooper said as he nudged Tugboat with his foot in hopes that she had heard some of that and would scurry into sanity. "You have the attention of my two-hundred million viewers, Mary, now tell us what you really want.". "Ketchup!" Mary bellowed, her eyes rolling a little ways back in their sockets and hands busy with something wet. "And TV Guides. Lots of Ruffles with ridges, and elastic. You have white bread, honey? You know a few dollars goes a long way with Tugboat." "As the day cartwheels recklessly into night," Cooper later reported to the world, "the Occupy St. Peter's Square cellophane-tent-city has grown larger and grumpier by the minute. No church official has come to bless the crowd, although a lone priest was seen quickly circling the tens of thousands of people who've involuntarily taken a vow of poverty. The priest, Father John Murphy, tried not to make eye contact and pretended to be very late for something. Meanwhile, a few thousand of the destitute have built a bonfire to cook a package of instant rice one of them found in the Vatican dumpster, and a hundred more drink down and pass around bottles of beer on the Vatican wall. Joey No-thumbs, a Minnesota student traveling Europe by rail before losing his money and thumbs in Naples, joined the crowd in order to organize a petition pleading for Pope Francis to 'open his heart and release just a little itty-bit more of the church's total riches in real estate and the markets to the needy of the world. Which would really go a long way'. Joey soon lost the petition, his shoes, his remaining candybar and his "Go Wolverines" cap in the crowd." "As you who've been following this assembly on CNN know, we've tried all day to find a Vatican spokesman to comment on the Occupy St. Peter's Square Movement," said Cooper - now just called 'Anderson' or 'Andy' by the crowd - "and we finally have a church representative who will speak to us, an elderly nun who has somehow wandered into the Square by mistake. Sister Helen, Sister Helen, over here please. Thank you. Sister Helen, as you know, Pope Francis said he wants to be the Poor People's Pope. Why do you think he is staying silent on this rapidly growing Poor People's Occupation, which really isn't asking for all that much considering?" "Ketchup!" Sister Helen bellowed, her eyes rolling a little ways back into their sockets and hands busy with something wet.